THE PRIZE FOR THE CHALKIE VICTOR : A computer and other fantastic prizes. "[guessing] neither progress nor conservatism because there's nothing left to conserve and no direction in which to progress. So what you get is transition. Transition to nowhere." THIS WEEK'S CHALK THEME: "adam sez: .I'm thinking aliens and/or the park itself." BUT THAT IS NOT ALL as a special bonus the winner shall receive a brand new MACKINTOSH COMPUTER iMAC (circa 2004? see http://i.feedtacoma.com/Thorax%20O'Tool/good-home-computer-needs-new/) This is the very same computer our very own MAYOR BILL BAARSMA used once to send a turgid email to the Mayor of Seattle. GUARANTEED! BUT WAIT RIGHT THERE PARTNER!!! THERE'S MORE!!!!!! This Friday we celebrate the birth of chalking zealot PATRICIA MENZIES. She will have cinnamon buns for anyone so inclined. EAT A BUN FOR VICTORY! last weeks BEST ILLUSTRATOR IN THE UNIVERSE winner: Adam the Alien! Sponsor: Cartoonists League of Absurd Washingtonians (The CLAW)! by Erik on 7/10/2009 @ 12:25am Former councilmember Bill Evans said he might stop by. That would be cool. by ElectricElliot on 7/10/2009 @ 12:41am Triple sweet. by L.S.Erhardt on 7/10/2009 @ 2:02am It's more like circa 1999.
by nigelzfinch on 7/10/2009 @ 6:31am mac would be cool... and anything would be an upgrade to a 10 year old blue screen of death dell! An ol artist would be a fool to miss this. No excuses! by KevinFreitas on 7/10/2009 @ 6:49am Looks to be a great day with some great prizes available (thanks Atheists and Thorax!). Weather should be stellar but wear a hat or sunscreen out there. See y'all at noon! Oh, and especially for anyone new but really for all chalkers, make sure to sign your name clearly on your piece so everyone knows who you are when posting pictures of your work for voting. by Mark Monlux on 7/10/2009 @ 6:59am I know what I'm going to draw! Beware All! Bu wa ha ha ha ha! Hey! Where is the Chalk Off Scoreboard for this year? by Dave_L on 7/10/2009 @ 8:26am I'll be working up in Issaquah today and can't make it. But I'll drive by later. I'm sorry I've been terrible the last few weeks at getting down to FP to clean the walls. I could use some help spearheading that if someone else is more available than I, and can fetch water from Scout's, if Kevin has the key. I wish I still had my Timex/Sinclair computer to donate as a prize. @Dave_L we need to coordinate better, yes! There's an RR gallery there that needs some attention, but now I almost don't want to wash it off! Happy Birthday to Patricia and great job everyone! Plenty of happy people walking by enjoying the art and I'm sure will be after we leave. I gotta vote Stowe for his amazing shark. The detailing is incredible and I really want his kids to get the use of that Mac up for grabs today. by L.S.Erhardt on 7/10/2009 @ 2:16pm The shark is pretty slick, but I like my robot, dammit. I vote for me because I like robots way more than sharks. by NineInchNachos on 7/10/2009 @ 2:31pm amazing shark. Nice 3D robot. Nice circuit diagram. Really like the plate spinner too. Sorry I missed everyone! by L.S.Erhardt on 7/10/2009 @ 2:35pm Where were you, RR? by nigelzfinch on 7/10/2009 @ 2:39pm Ooops. Apparently nigelzfinch (Van) forgot to sign his finch on skateboard so it piggybacked on the work beneath it - her work ( "keep on track" - "777" ?) therefore got Van's name on it too. Sorry 'bout that Kevin. Only the finch is van. And van is bad, bad, boy! Nigel will punish him for you. by KevinFreitas on 7/10/2009 @ 2:39pm I also wanted to give Thorax kudos on his piece. Best one to day, imho. Great illustrative style! by NineInchNachos on 7/10/2009 @ 2:53pm surprise 'company appreciation party' choking on 2 stroke exhaust fumes at indoor go cart tract. I admit I was outside my comfort zone but it was interesting playing pole-position with my physical body. by ElectricElliot on 7/10/2009 @ 2:54pm Great white, hands down. I vote Stowe. by NineInchNachos on 7/10/2009 @ 2:54pm HAPPY to see Stowe and Andrea back though. How cool is that? by NineInchNachos on 7/10/2009 @ 2:56pm I think Mark Monlux crossed the line with his obscene chalk entry. Socked! He was our most wholesome claw member. 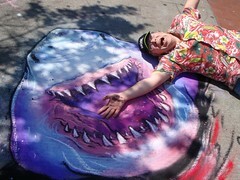 by jamesstoweart on 7/10/2009 @ 2:57pm I am breaking an often broken personal karma rule and voting for my shark. I really want that iMac for my kids... it would be perfect for them. In fact, if I win I'm willing to give the Crown bar gift certificate to the 2nd place runner up. I'd keep the title though... cause that is where the real treasure lies. VOTE FOR SHARK... AND IT WON'T EAT YOU. by thriceallamerican on 7/10/2009 @ 3:03pm surprise 'company appreciation party' choking on 2 stroke exhaust fumes at indoor go cart tract. Ha. I did that as a work function once. I could physically feel the brain cells dying. by nigelzfinch on 7/10/2009 @ 3:04pm James, Nigel says he'll put his head in the shark's mouth if you let him have the imac instead of the "Crown!" by NEAL on 7/10/2009 @ 3:05pm Andrea. by NineInchNachos on 7/10/2009 @ 3:19pm Yeah big announcement was with the new tax credits available Artifex is going to move forward renovating the 1888 building! We're moving to top floor, and the two street level floors will be rented out. by TacomaAtheist on 7/10/2009 @ 3:24pm I vote Andrea's death ray pothole maker. Totally. by daydreamer on 7/10/2009 @ 3:27pm I really like Thorax's best, but I am voting for the shark since Stowe wants the computer so much. Good luck Stowe! by Mark Monlux on 7/10/2009 @ 3:36pm As much as I enjoy Stowe's shark, I believe that Thorax's Robot is closer to this week's theme of ALIENS. I vote for Thorax's Robot because they are Very Cool! But Mark is ever so yummy! by itsbooyer on 7/10/2009 @ 3:37pm Great entries this week by everyone. It's between Stowe and Andrea...I'll vote Stowe. Stowe, if you had emailed me before Wednesday, 6am you could have just had the machine. Anyway, If I win you can still have the iMac. It's got an 80 gig HDD with Panther on it. So your kids will like it. by Erik on 7/10/2009 @ 3:54pm I was set to vote for Stowe, but Andrea's piece looks impressive on film. Tough choice. by nigelzfinch on 7/10/2009 @ 4:10pm Yeah, put me down for Andrea's entry. And thanks for the photo update Darkain. by Zanna on 7/10/2009 @ 4:30pm (I vote for Thorax) Thanks to Thorax for telling me how to post! The Shark makes me wonder if it went up against the Happy Whale who would win? ... We will never know. by NineInchNachos on 7/10/2009 @ 4:56pm oh the poor happy whale. (s)he never saw it coming. by L.S.Erhardt on 7/10/2009 @ 5:48pm Whale for sure would win. It's rainbow of happiness would smother poor jaws under wholesome goodness in quantities so large the FDA would have to get involved. by L.S.Erhardt on 7/10/2009 @ 5:50pm You know, I think I'd like Stowe's kids to have that computer. I hereby, in an unprecedented action, officially change my vote to Stowe. by NineInchNachos on 7/10/2009 @ 5:54pm sayWA!? by Erik on 7/10/2009 @ 5:59pm Tonight is going to be close. I vote for Andrea's chalk entry. by L.S.Erhardt on 7/10/2009 @ 6:10pm This week is all crazy! RR absent, me voting for someone else, the return of Andrea and Stowe, giant robots and sharks! Sometimes I just love this town! by Adam the Alien on 7/10/2009 @ 7:59pm I have to vote for Andrea for taking the alien theme, making it locally relevant, and for utilizing her drawing to express something that was on her mind. When she arrived at the park, she was ranting and raving about the evils of the potholes, and then ended the conversation by saying she was going to go take out her frustration on the sidewalk. As most people know, I am quite fond of this method. 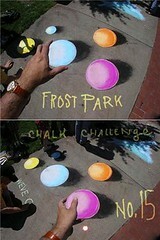 Chalk art is a wonderful form of therapy and self-expression. Plus, I believe i stated many times last year that I effing LOVE epic amounts of black. And that is a lot of black. Though it does seem like there was more black in person than in the photos. I have to say, thought, ftw, I saw Thorax's piece and went, oooooh! (it was very futurama-reminiscent and made me happy.) --Then I saw Stowe's piece and went, OOOOOOOOOH! ---the shark is, like... dude. crazy-cool-good. --And then I saw Thorax's goodwill toward kids o' Stowe and have to say I'm in a dead-heat tie for the both of 'em. by Earthdaughter on 7/10/2009 @ 9:23pm Great work again this week! Love you folks! Talent, humor, warped minds! What else could anyone want? I do think it's a bit odd, though, to be deciding the winning art piece based on who you want to win the prize. I'm perfectly happy to see the Mac go to Stowe's kids, but I'm voting for Andrea's alien explanation for the "traffic calming devices" that have been appearing on STW. by NineInchNachos on 7/10/2009 @ 9:24pm I vote for stowe. Lets hear it for photo realism in chalk! by NineInchNachos on 7/10/2009 @ 9:27pm my second place vote goes to the plate spinner entry. I believe Stowe is just exploiting an emotional appeal to gain votes which is perfectly legal part of frost park chalk voting; part of the fun. You can say whatever it takes to get votes. the tweet skateboard is pretty bitchin. by Courtney on 7/10/2009 @ 9:45pm I vote for Stowe. Not because of the computer but because I think it's his best yet. by tacomachickadee on 7/10/2009 @ 10:19pm I vote Andrea ... though I was tempted by many. by Libby on 7/10/2009 @ 10:30pm STOWE gets my VOTE. I VOTE for STOWE. Kevin told me it is very important to include the word VOTE in my VOTE for STOWE. by Girl Who <3 JUNK on 7/10/2009 @ 10:58pm Hmmmmmmmmmm! Very nice work from all the chalkies. by Dave_L on 7/10/2009 @ 11:02pm I had to cheat and look it up, but looks like the heart of the circuit is a photocell, and it sure was a good day for it. So many nice entries. It's so hard and painful to vote for just one because the whole collection gets my vote. Spinning plates was nice. Adam is stronger week-by-week, as well as Thorax. I'm leaving some out.. I really like Andrea's a LOT. But I really like Stowe's, too, and he makes a compelling reason that I can't ignore. My VOTE is for STOWE. RR, I think at my work we looked at part of your building renovation, but regardless of if we're involved, congratulations! (And thanks for the mention in the vid.) P.S. - I hope to see some of you again participating in the Iron Artist competition at the end of this month. by Erik Hanberg on 7/10/2009 @ 11:26pm I agree. Tough choices. I'd like to cast my vote for Stowe. IT's a really great shark. by ALT on 7/10/2009 @ 11:26pm I gotta vote for my favorite: Adam's craven, alien puppeteer of chalk art. by kaotix on 7/10/2009 @ 11:39pm My vote is for Andrea. Though the shark nearly won me over. Sorry Stowe. by Erik on 7/11/2009 @ 12:30am Tough choices. I'd like to cast my vote for Stowe. IT's a really great shark. Nice. Do you like it enough to cast your vote for Stowe's piece? Even if you don't count Thorax's change up or Erik's "I'd like..." Stowe would've edged Andrea out by 1 vote still. Great work out there everyone and congrats to all the beautiful chalk artists for helping bring a little art and life to downtown Tacoma each week. by Erik Hanberg on 7/11/2009 @ 8:52am Oops. My "I like" was not intended to be conditional. Yes! Vote cast for Stowe! by ALT on 7/11/2009 @ 1:27pm Congrats Stowe! I didn't expect to even be close to the win this week. A rather close one! by jamesstoweart on 7/11/2009 @ 1:31pm Woo Hoo! I hope my kids dig the iMac. It is good to introduce brand snobbery early. And true to my word I'd like to make sure the $40 gift certificate to the Crown Bar goes to Andrea. As usual she always gives me a solid run for my money... it is only fair she gets a gift certificate equivalent. Thanks everyone for voting for me (whether it was for the art or the obvious/y brazen emotional ploy involving children). I love coming out to the park every week and hanging out with other artists. I'm glad I broke my Frsot park dry spell. to arrange transfer of the iMac. I'll dust 'er off and get all the goodies together. It has the original grape keyboard, 1 button mouse as well as all the OS9 discs. Right now I have Panther on it, and the new HDD is 80 gigs. I upped the ram from 64mb to 160mb as well... it's about as pimped out as an iMac G3 could ever be. I think your kids will like it. by Erik on 7/11/2009 @ 5:17pm Congrats Stowe! What a great week for prizes. by Adam the Alien on 7/13/2009 @ 12:53am Okay, so the Crown Bar gift certificate goes to Andrea, Stowe? What about the backpack? Apparently there was a backpack donated with the gift certificate, as well. And since I ended up the temporary guardian of the certificate and backpack, I need to know who the Hell I'm giving this stuff to. by Erik on 7/13/2009 @ 1:32pm Work for Chalk Artists?? Laurie from the Gig Harbor Art Festival wants to hire about 3 artists to create art on the sidewalk/cement area of the festival. Want to earn a few bucks for a few hours on Saturday? You're interested now, right? 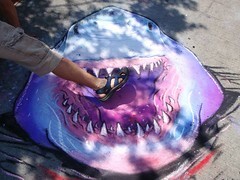 Do you have photos of your previous sidewalk art? Phone pictures are ok, just need something to show her. by Dave_L on 7/15/2009 @ 1:13pm Anyone up for washing the chalk tonight or tomorrow? Perhaps Kevin-with-the-Scout-key for water access? Just askin. It was a pain driving buckets of water down, and I don't want to bug India Mahal again (though they've been gracious). by Dave_L on 7/15/2009 @ 7:59pm I mean the key that "Scout" gave Kevin for this purpose, since she has a water spigot available a block away, behind the locked front door..... But we do have to check that water spigot that's somewhere around Frost Park. by L.S.Erhardt on 7/15/2009 @ 8:03pm Get in with the city on this one? I mean, you'd think they'd be all over giving us H2O so we can clean the park so they don't have to.